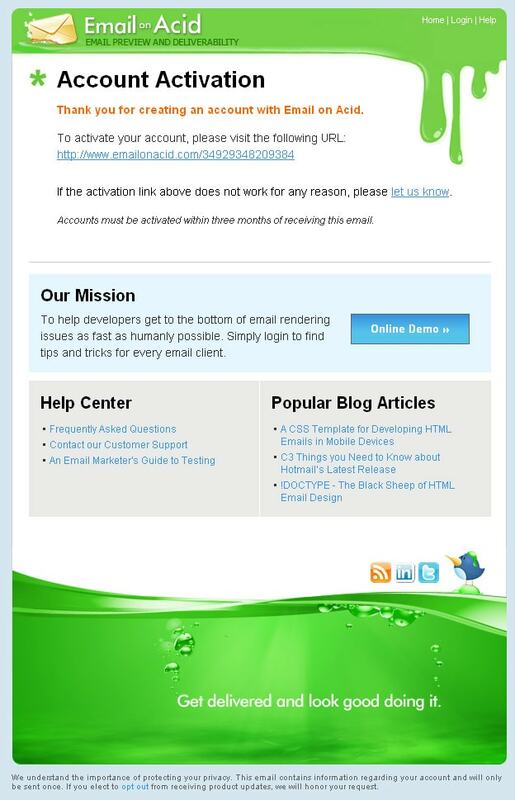 We realize that people are less likely to download images from automated emails so we wanted the header and footer to flow with the design either way. This technique works for most of our targeted email clients so for us, it’s well worth the extra effort. 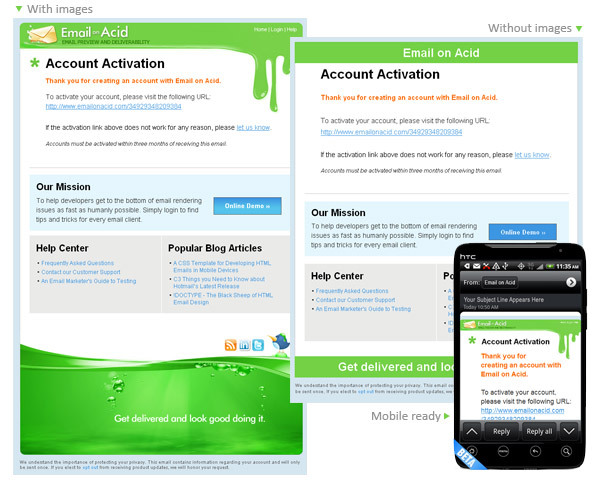 <div align="center"><img src="https://www.emailonacid.com/emails/response_emails/header.jpg" alt="&nbsp;&nbsp; Email on Acid"
We intentionally left out the width and height attributes for the image so that the green bar does not render as a grey box in Hotmail/Firefox and Outlook 2007/2010. We also didn’t want to take up too much vertical space for the footer when images are hidden so we used the same treatment for that as well. We also wanted our “Online Demo” button to render correctly no matter what. Once again, we started with a nested table and used the background attribute from within it’s TD. 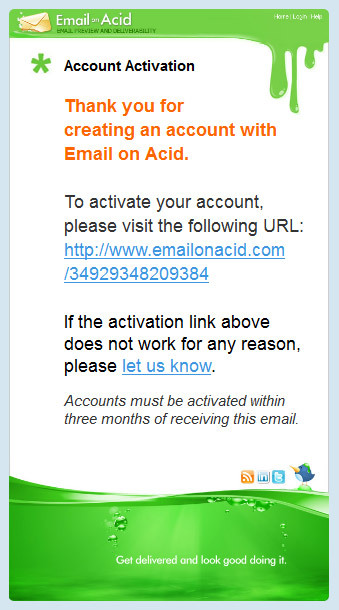 <td width="150" height="35" align="center" background="https://www.emailonacid.com/emails/response_emails/button_back.gif"
Last but not least, we created a toned down version for our mobile viewers. 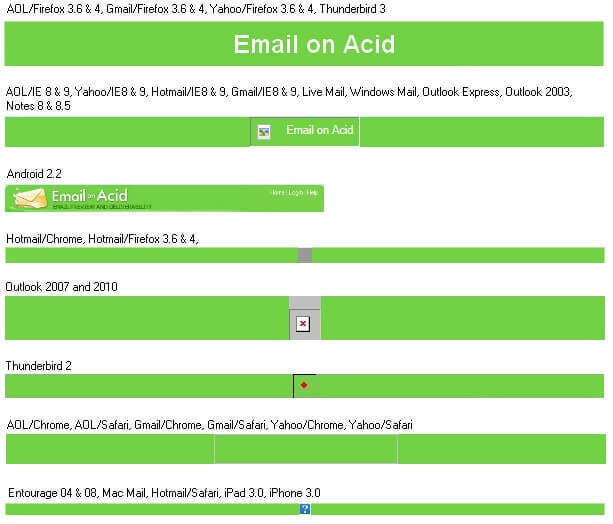 As you can see, we resized the container tables and each of the header and footer images via CSS. In this case the CSS trumps all of our preset HTML attributes. We also adjusted the headline to be a bit smaller and hid some of the “added bonus” items. In case you were wondering, we used attribute selectors in our media queries to ensure that Yahoo does not render our mobile version. Click here for more info.